Steve Acevedo (B.A. ’00) knows how fortunate he is to have a rising career as a director and cinematographer in Hollywood. “It’s a difficult industry to break into, and I’m grateful I can make a living doing it,” he said. Acevedo earned a prestigious Disney/ABC-Directors Guild of America Directors Fellowship in 2008 after graduating from film school at Florida State University. He shadowed directors of TV shows, including Grey’s Anatomy and Desperate Housewives, for a year. Speaking of difficult to break into, 800 people applied for that fellowship, 26 were interviewed and only three earned spots. These days, Acevedo continues to shadow television directors as an NBC Universal Directing Fellow. He also directs and shoots feature-length and short films as well as commercials, music videos and a Web series called Minda (Never) Lerns (yes, that’s how it is spelled). His work has been screened at festivals including SXSW and Cannes Film Market. 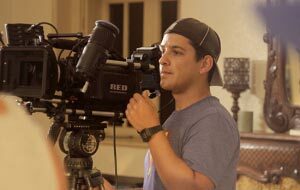 Acevedo received praise for his cinematography in the feature film Satellite of Love, shot last year in Austin and recently released on Amazon and iTunes. He also directed El Cocodrilo, a short film starring Jacob Vargas of Traffic fame, which earned honorable mention at the 2013 CineFestival en San Antonio. But everyone has to start somewhere. His first film – a lurid story of an urban turf war, with all the dialogue in rhyme – premiered on a pull-down screen in the Reinbolt Hall Theater. And it might never be seen again, he joked. 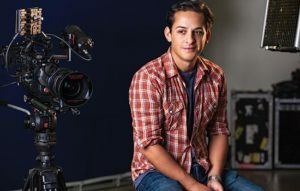 Acevedo came to St. Mary’s as a Biology major with his eye on a career in medicine, but a TV production class he took nurtured his true desire: cinema. “Dr. (Lucien) Manchester begged me not to change my major. ‘Why would you change your major?’ He took it worse than my parents,” Acevedo recalled of the Biology professor. So the next year – as an English-Communication Arts major – he teamed up with a friend, Ariel Gonzales, to write his first film and shoot it on his parents’ Sony Digital 8 camera. “Filmmaker” is an occupation that gets tossed around more often now that inexpensive technology and the Internet have simplified video production. Anyone can afford a camera and make a movie, Acevedo said, but he offers some advice for aspiring filmmakers. Acevedo points out that more than talent is required to make it in this business. There’s also luck involved. Some people, though, make their own luck.